You’re planning a holiday and bringing your senior dog along for the fun. You want to find the best pet friendly hotel, but aren’t quite sure where to start. You first have to determine what “best” means to you, since we all have different criteria by which we judge. I would say it’s what meets the needs of you and your family…furry family member included! How do you know if a hotel is pet friendly? If you use a booking site like booking.com for instance (I have no affiliation it’s just one I use), once you type in the destination, dates and number of people, you will find a menu on the left where you can filter by various criteria. Tick the box for “pet friendly” and start there. Once you’ve narrowed down the list to hotels you’re interested in, check out the questions I’ve recommended below. The answers will be available in the description or on the hotel’s own website. I still recommend you check with the hotel in case the information presented is a bit outdated. Just because a hotel advertises themselves as “pet friendly” doesn’t mean they’re loving the fact they have animals walking around…the 4 legged kind I mean! Of course they want to make money and they’re appealing to the pet lovers who don’t want to leave their furry companions behind, but how much will they welcome you? How much does that matter to you? Is there an extra charge and if so how much? Is that per dog? Per day? Is a deposit required in addition to the charge? If yes is it refundable? Is there a maximum weight or size allowed? Is more than one dog permitted? Are they allowed on the furniture? Is there a cleaning charge if dog hair is found? Are there areas of the hotel that are off limits? Does the room contain a fridge to store pet food? Can dogs be left in the room? Do they have to be crated? Is there a quiet, grassy area nearby to walk the dog? Would they have a list of nearby vets, emergency hospitals, dog walkers or doggy day care facilities? While rules will vary from place to place (i.e. size of pet, how many per room, extra charges…), here are some pretty standard requirements. Having said that, don’t assume they apply to the hotels you’re considering so be sure and ask before you commit. 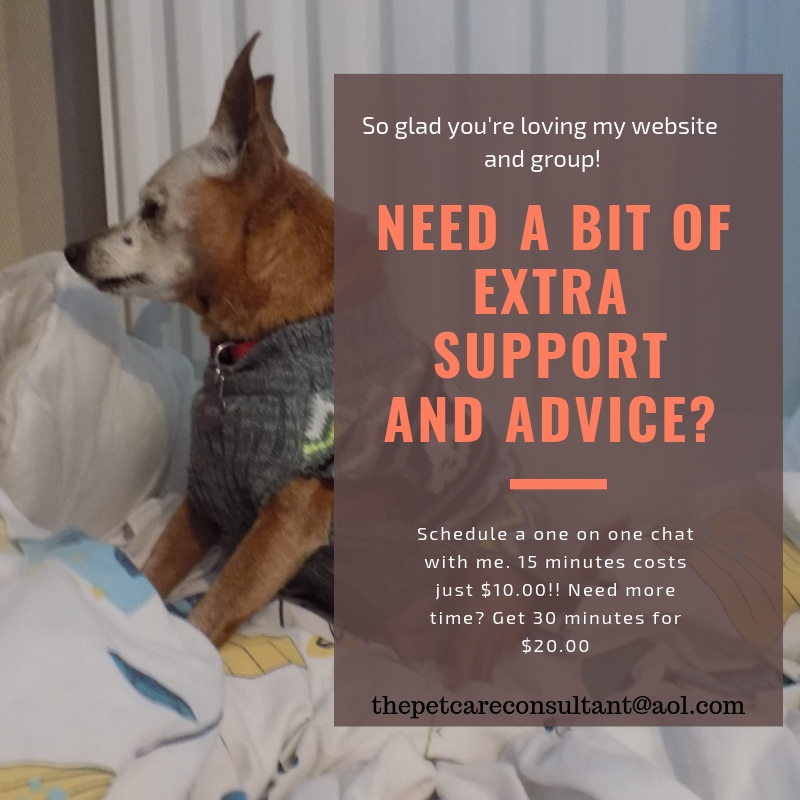 It’s up to you to decide how much pampering your dog needs, and how much you’re willing to pay for it. What floor would you like your room? Being on ground level makes it easier to take the dog out, especially if he’s having incontinence issues for example, or is restless due to dementia and doesn’t sleep well. However the first floor can be noisy, so ask to be as far from the lobby, reception and lounge as possible. Find out if there is a usable exit near your room so you don’t have to walk through the lobby late at night in your pjs!! Even if you’re staying in a hotel that provides for all your dog’s needs, you’re more than likely still going to need some supplies they won’t have, so check the list below to make sure you’ve got everything covered. For example, a run around a muddy park or a swim in the lake means a filthy dog walking through a hotel lobby. At least if you have cleaning wipes or a towel you can wipe him down and dry him off before he adds paw prints to the design of the lobby floor. Research vets, emergency hospitals and perhaps a doggy day care at your destination. Even if the hotel does offer that service you never know – the list may be lost, it’s not kept current… Be prepared and find it out for yourself. I don’t know about you, but I love lists!! Even if it’s for something I do all the time, I feel comforted knowing the list contains everything I need so I don’t have to remember everything. That becomes even more important when travelling with a senior dog, especially if medication, pee pads, diapers and the like are part of the package! I also never assume I can get INSERT NAME HERE at my destination…I pack assuming I can’t! If you’ll be staying in a hotel that pampers your dog even more than they pamper you, there may not be much you need to bring other then his pet passport and medical records. Use the checklist below to be sure! The way I create my list is really quite simple. I write down every medication my dog takes, and then go through her daily schedule and add each item to the list, keeping it handy whenever something else pops into mind. I have only stayed in a hotel with my dogs once because all the travel we do is between home/family. It was when we drove to Spain from the UK, and knew we would be staying overnight on the way. The best thing I did was pack the dogs’ supplies separately from our own stuff. The food, water, snacks, medication, drinks, plates, bowls and plastic spoons in one bag, blankets, paperwork and pee pads for the hotel room floor in another bag. It made it much easier and efficient to care for the dogs once we stopped for the night. Because our driver wanted the freedom to drive as many hours as he could before having to stop, we weren’t able to research hotels in advance, something I’m typically extremely fussy about! The hotel he found allowed dogs in the room, but presumably due to its location it catered mostly to road traffic so there was nothing fancy about it. There was barely an area to walk the dogs, certainly no grass just dirt and bark chips but it was just for a few hours before we hit the road again so we weren’t fussy. It was not a place I would recommend or choose if we were going on vacation. I know you will be but I’m notorious for stating the obvious. By respecting the rules and being responsible we can encourage hotels and other establishments to re-think their “no pets” policy, and start welcoming our four legged family members. Have you stayed in a hotel with your senior dog before? What kind of amenities and services did you find important, or would like to have had? 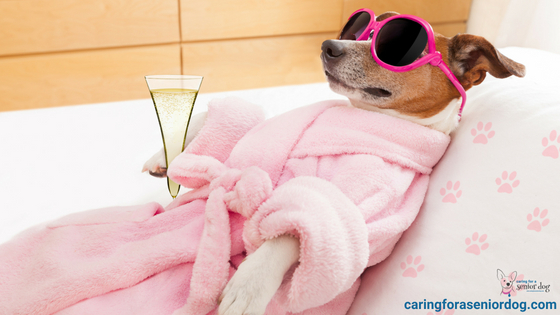 What tips do you have for making a hotel stay with a senior dog as comfortable as possible? Sharing helps others so please leave your comments below. I love your list, brilliantly done and I ADORE the picture. I can so imagine a pup relaxing in their own spoiled dog suite!! Thanks Marjorie, I also thought the picture was adorable! Fantastic post as it is something that has crossed my mind more than once what to do if we go to a hotel, so this now eases it for me if I decide. Thanks Ruth and of course Shana Tova to you and Laya! If you do ever decide to stay in a hotel, I hope these tips will help make your stay more pleasant. Great advice here! We travel a lot with Icy and Phoebe, both close to home and very long distance road trips. I’ve seen the big difference between hotels that are truly dog welcoming and those that simply offer the service to increase bookings but don’t really like having pets there. The difference in pet fees and the level of pet welcoming can be huge! Thanks Cathy!! I imagine you’ve learned a lot from your experiences and can spot the good ones!